Let us help with your spring cleaning. Gently used items? 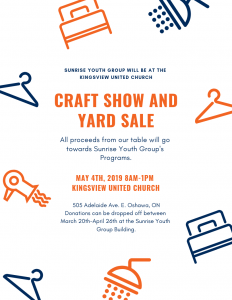 We are accepting donations for our table at the upcoming Craft and Yard Sale at Kingsview United Church on May 4th! Katie is a longtime Board Member and supporter of Sunrise Youth Group. She is the type of person to donate her time, resources and energy to others. She is also responsible for a beautiful family. 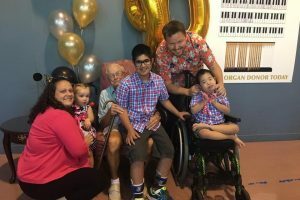 Two of her children have medical and physical needs that have begun to make traveling around the home difficult. They are hoping to raise funds to install a lift in their home making it easier for her two boys to go upstairs and continue living their lives as independently as possible. Any help that could be provided to this family would be greatly appreciated. LOOK AT WHAT WE HAVE GOING ON! Thank you to our AMAZING volunteers, staff and members for making Wabikon 2018 a success! Our organization relies heavily on volunteers in our recreation program to provide the proper support to meet the needs of our members. Since 1991, our volunteers have been the core of Sunrise and have built many meaningful relationships throughout the years. Our volunteers make our recreation events possible. We ask that you help spread the word to your families, friends, and communities about what we do and how they can be a part! If you know any individuals of any age looking for more community involvement, 40 community hours, references, or just a great experience, please express our need! Any individuals interested in joining our Sunrise family can contact Amber at volunteers@sunriseyouthgroup.ca or 905-438-9910. To foster friendships, promote independence, acceptance and integration of individuals with developmental disabilities in Durham Region. To provide programs for members and support for families that are positive and inclusive through recreational, social and learning experiences. Sunrise youth group is a non-profit organization that has provided quality recreational and life skills programming to individuals with special needs since 1991.We strive to develop inclusive programming that creates positive experiences for all who access it- whether it be our members, their families, or our volunteers. Sunrise is a positive outlet for leadership and creativity, and encourages all young people to explore their potential! The individuals who join in to become friends with our members are truly what sets Sunrise apart from all other organizations and certainly what makes Sunrise such a truly enjoyable experience! Volunteers fuel SYG programs with their energy, enthusiasm and new ideas, and are encouraged to take as much responsibility as they would like. What is especially unique is that there is no special experience required. If you are sincere, fun loving, accepting and reliable, then you have what it takes to be a Sunrise Volunteer! To sign up, simply call (905) 438-9910. There is no minimum attendance requirement. Just call and let us know what you are ready and able to do. It’s that easy!